Ability Flash Fire: Powers up the Pokémon's Fire-type moves if it's hit by one. "Don't... Don't come any further, please." History Rokai was born in a very small forest secluded away from almost everything. 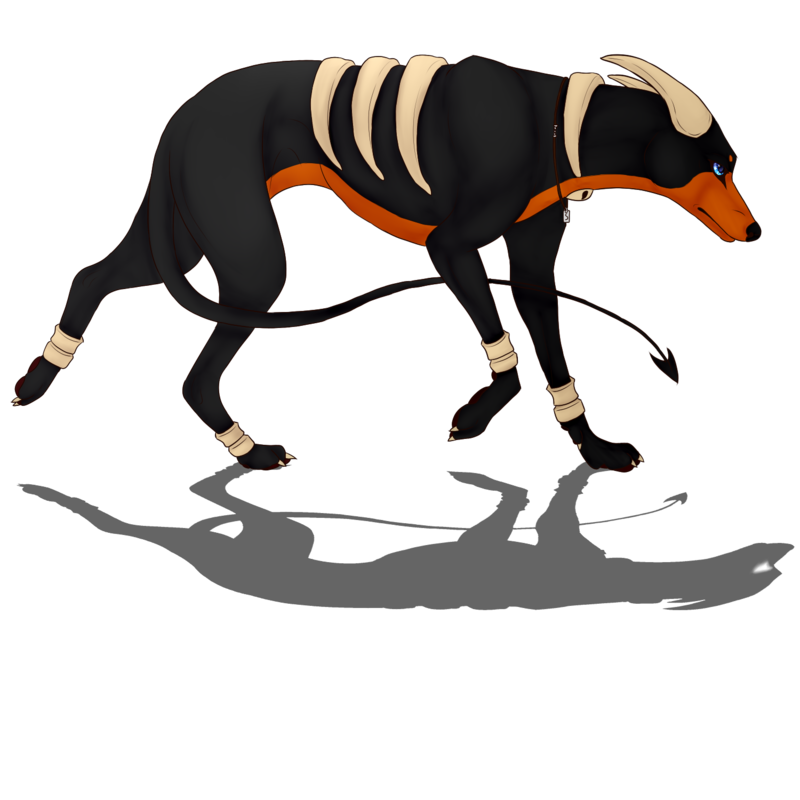 Unlike other houndour of his breed, his fur was completely ash-colored, a defect that had been passed down from his mother. From the very moment he hatched, there were only the three of them, his mother and father were both houndooms, but only his mother showed him affection. His father was always cruel to both of them. His mother never had time to stop and play, as his father always sent her away to hunt or collect items for hoarding and future use. Many of these items were rounds disks that his father used on himself by pressing them to his head. One time, his father ignored the two disks that his mother had brought home, so copying his father, Rokai pressed them to his head, not knowing what they did. Another downside to his mother being away all the time was the fact that his father always wanted him to get stronger, and would get his mother to bring home live pokemon, which his father would pit up against him. More often than not he lost, with the pokemon being much higher leveled than he was. There were countless days where he would lay in the corner of the den, believing that his mother still cared enough to give him those disks, because she must have known that his father didn't want them. One day his mother didn't come back from a hunting trip. His father was furious calling her a wimp and that she'd run away. Because she was gone, his father had to do all the hunting, except because he hadn't needed to hunt for a while, he was terrible at camouflage and ended up getting caught by a trainer, leaving Rokai all alone. He waited there for days, hoping for one of them to come back and say it was going to be okay. When he finally had to move, the world around him was very different. Many places were deserted and pokemon that looked positively dead walked around everywhere. He fought off as many as he could, the extra skills he had picked up from the battles his father had forced upon him gave him a slight advantage, and he eventually climbed his levels until he evolved. When he evolved, it wasn't a pleasant feeling, yet it didn't hurt either. Another bone sprouted from his back, joining the other two that wrapped around his ribcage. A second bone came from the middle of his neck, wrapping around the front of his chest, in front of his forelimbs and lastly a skull formed between the first two bone protrusions at his chest. His fur however stayed completely ash colored, not gaining any orange to it at all, just like his mother. With his new form he was able to fend back more zombie pokemon, fleeing the safety of the place he one called home. Accent Soft spoken british accent. Motivation Be kind, and try to keep people happy and hopeful. Personality Pros: Kind and patient, Rokai is very gentle around people, and will often take the submissive, or passive side to any confrontation. He wants to mediate and find a peaceful way to solve any conflicts. He knows his way around forest terrain, and is good with survival tactics, such as hunting and foraging for food, or making shelter. He's very protective of those younger than him, or people with an injury that makes it hard for them to survive on their own. Cons: Shy and sometimes very hesitant, Rokai doesn't do well under pressure, and can be prone to snapping when pushed too far, even if this point is hard to get to. Often down in mood, and haunted by his past, Rokai can find it hard some days to find motivation to do things. Can be distant from others, and has a fear of other male houndoom. Other: Because of how close Shadowmere is to him, Rokai is very protective of her. User Notes -Revamping of Rokai's profile to show events of previous team and better fleshing out his personality. Development Notes Evolve into Houndemn, and his personality is gonna change overtime. 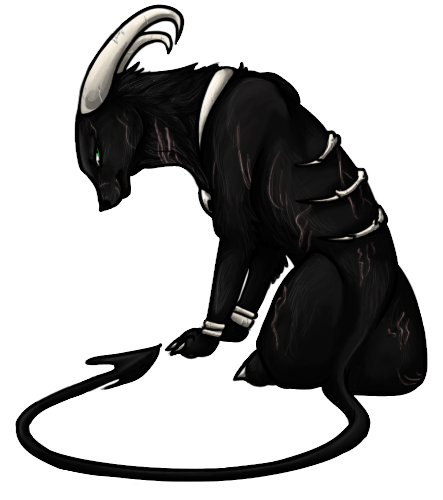 "D-don't l-l-leave me... I-I d-don't want t-t-to be al-lone again..."
History Shadowmere was born to two houndoom, only her and her brother, whom was born blind, his eyes a pure white. Their parents gave them each a name, Her brother Ivoresque, after his white eyes, and herself, Ebonese. Despite their grand names, they were not treated well. They were beaten, crushed and tortured. Ebonese tried to protect her brother, and there were countless times where her brother would cry over her broken and bruised form after each beating. She would stay quiet, and never argue. It was all to protect her brother. Every scream he let out, she was always there. Until that one day. Ebonese was alone with her brother, their parents were out. They were just playing their normal game of hide and seek when their parents came home, looking angrier than usual. The two had learned to stay away during these times, but in her panic, she forgot to lead her brother away from the raging dark types. She realized too late, and when she turned to help him get away, she was horrified at what she saw. Her father held the blind houndour by his neck, shaking him violently. Blood flew everywhere, and his cries of pain sent Ebonese into tears. Crawling forward, she choked out pleas to let him go, to punish her instead, but her words were lost. Her brother's spine was ripped from him, taking any chance she had of saving him. Her parents then left, leaving them for the last time. Ebonese was left to cry over the remains of her brother, unaware that she was enveloped in a bright light. 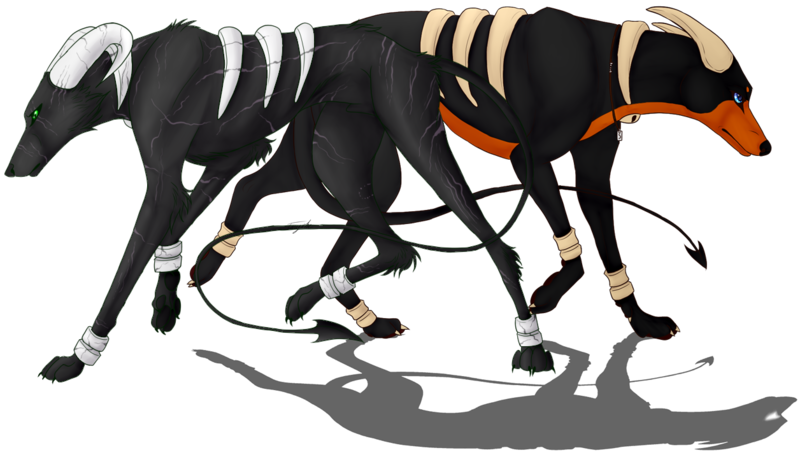 Her howls of sadness echoed through the forest and the houndoom, wrecked by greif, simply wanted to see her brother gain. When Ebonese's blurry vision cleared, a shadow of a houndoom, it's eyes as white as her brothers was standing in front of her. She changed her name to Shadowmere, to honour the soul of her brother that stood by her. She listened to her brother's words, and he led her to a human city. She trusted her brother to help her, and because of how houndoom were said to have the cry of the Grim Reaper, many humans fled. All except one. The human was fascinated by Houndoom, intrigued by the dark hound. He had a special necklace that allowed him to hear what Shadowmere was saying, but he could never guess why the houndoom seemed to stare off into space at random times, listening to something that he could not see. The human gave her a necklace with a metal tag. On the metal tag was the letter 'S'. She knew this meant that the necklace belonged to her. The eerie thing was that when she got the necklace, her brother got a similar necklace, except there was an 'I' instead of an 'S'. The human was known by the name Krypt, even though it wan't his real name. Krypt took care of Shadowmere, even if she was extremely weary because of her past. Krypt trained Shadowmere to a high enough level that she could defend herself from nearly everything, and used a weird disk to teach her a new move. Even so, she still went by her brother's words. He knew something bad was going to happen, but none of them expected what did happen. The Epidemic was the one thing none of them expected. Krypt knew what this meant. He told them to run, they would join up again sometime. Shadowmere got the same thing from her brother. She ran, leaving Krypt. Her brother was her only company now. Once again, it was only them. Accent Soft spoken but sweet voice. Personality Silent, Protective, Defensive. Shadowmere is very quiet, and tends to keep to herself most of the time. She is very protective of younger pokemon, and is very defensive of the shadow that follows her around. She knows that her brother still lingers in the shadow, and she will occasionally talk to the shadow. Others: She has Monophobia. Because of this Shadowmere has grown extremely attached to Rokai. User Notes -Revamping of Shadowmere's profile to show events of previous team and better fleshing out her personality. -The shadow is a hallucination, formed from Shadowmere's grief. It cannot be seen by others. Development Notes Grow to accept her brother's death, stop the hallucination of the shadow.